Slept well. It’s so lovely to report that every day! And woke before the 6am alarm – that’s 3am in Perth and our usual going-to-bed time! David made us a cuppa each and I’d had about 2 sips when I suddenly remembered what the date was. David’s birthday!!! Oh dear. I’d remembered the night before and put my carefully hidden stash of birthday cards for him on my bedside table, hidden under a brown paper bag. Fat lot of use that was when I didn’t remember! But he never cares, and was very happy once I wished him a happy birthday and gave the cards all to him. He did very nicely too. We got dressed, gathered our things together and had a hasty breakfast of… (I bet you can guess!) and a cuppa and then went downstairs to wait for our 7:20 bus. We were a good 10 minutes early, out there in the cold, stiff breeze, but fortunately the bus was early too and we clambered aboard. There was only 1 other couple already on board and they were half way along the 25 seater so we grabbed the front seats, directly behind the driver and with a good view out of the front window, woo hooooo!!!! I’d hoped to get a seat I could take photos from so this was a dream come true. 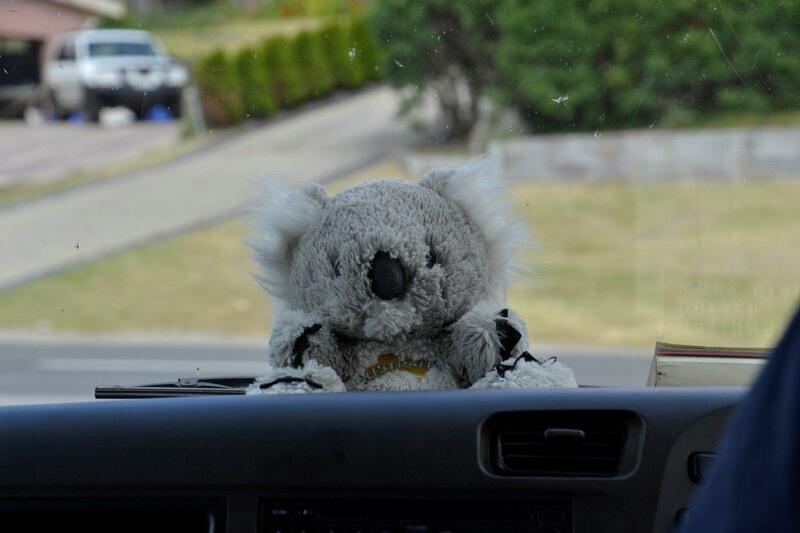 Our very lovely driver’s name was Campbell and he was actually a Perth boy, but had lived in Melbourne for 3 years. 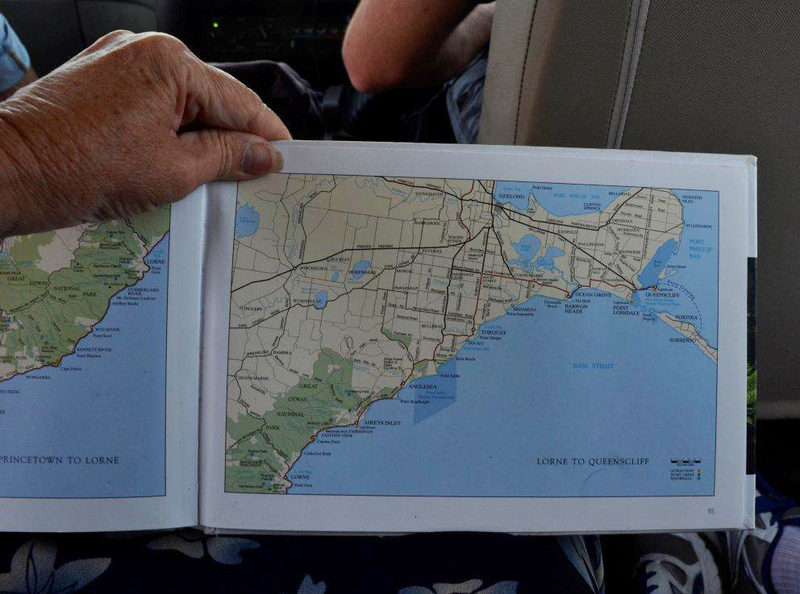 We drove around the city a bit, attempting to pick up other passengers but at the first stop the people were not ready – after Campbell had wandered around for quite some time trying to find them so we drove to the next place and picked up quite a few people from there. Then around to meet another bus that had been picking up passengers for us and they all piled aboard. Then back for the people who had not been ready. Campbell went into the hotel and the 3 people came out of a different door and spent much wasted time trying to get into the bus, but the door was shut and could not be opened by a passenger so they had to wait until he eventually arrived back. And when they were finally able to get on board they did not look very amused that they would have to sit separately. Well, I didn’t have any sympathy. If they’d been ready in a timely manner – ie 5 or 10 minutes earlier than asked – they could have chosen from any of 21 seats. By the time we left the city we’d been on board the bus for about an hour, and the lovely young Asian couple even longer! I was starting to wonder how long it would be until a toilet stop because I knew that we had a long drive ahead of us. Campbell asked if anyone wanted to come up to the front and be co-pilot and one of the German ladies took him up on the offer. She was really gorgeous and they chatted very happily about many topics as we drove along. Her English was outstanding and covered many areas of the language, which always amazes me. What do I say about this day? We drove far but Campbell was wonderful and we stopped regularly for just the right amount of time so that we didn’t feel rushed or herded. Probably my best bet is to just show you some photos and only give minimum commentary until needed – until we get to David’s birthday present from me. This was very aptly pointed out to us as a ‘house on a pole’. 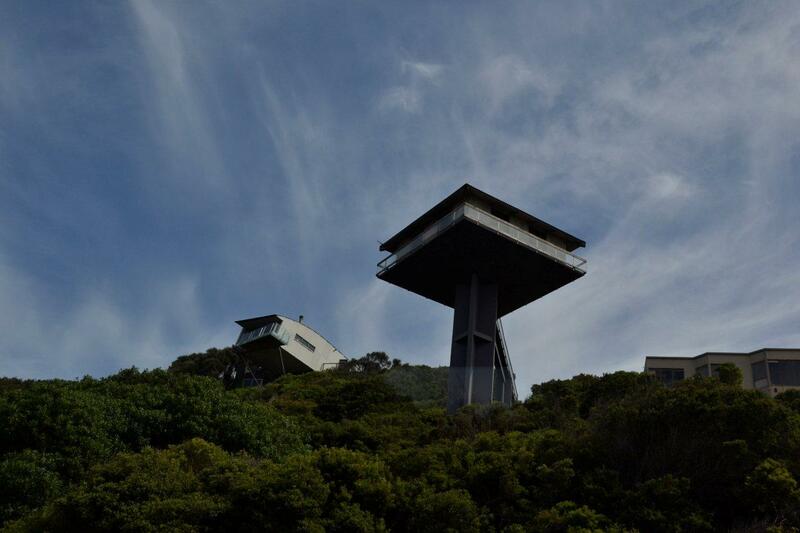 Apparently owned by a German couple and you can rent it out for a fairly princely sum per night. I liked this quaint little bridge and managed to get a hasty shot as we approached it. 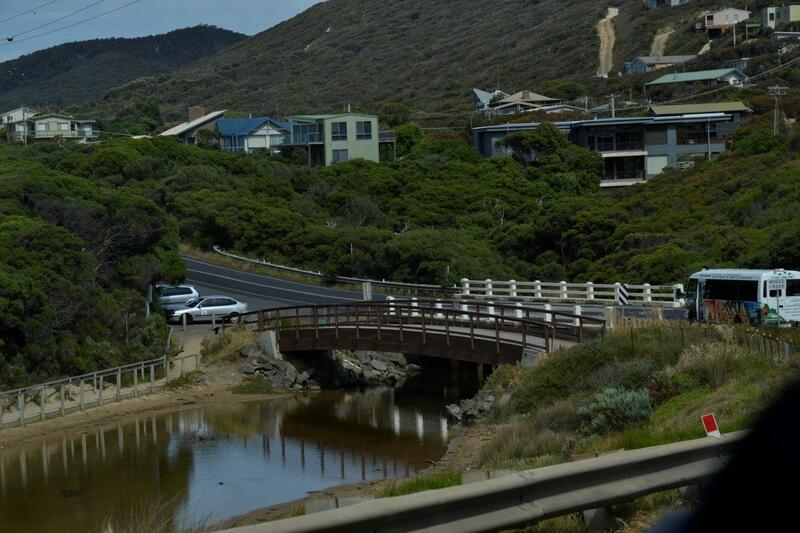 Country Bridge – Please comment if you know the town! 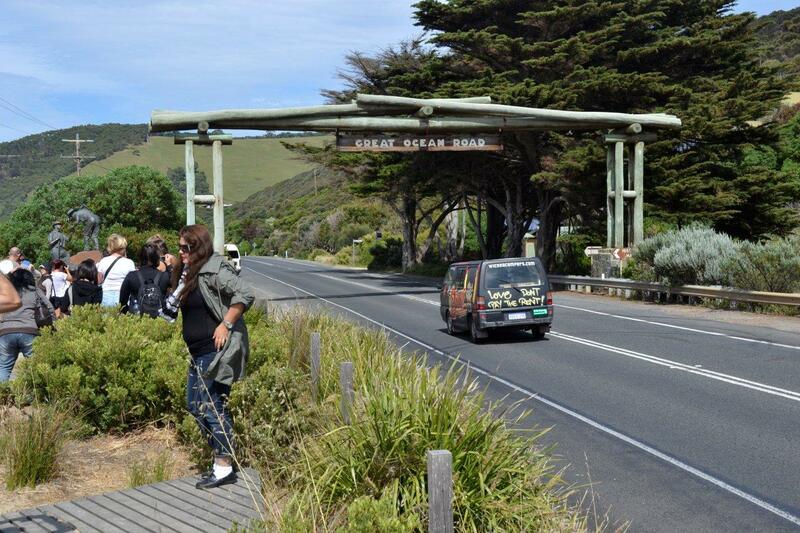 This is the official gateway to the Great Ocean Road but was far too full of tourists for me to be very interested in taking a serious photo. We covered all of the coast road shown in the map below, plus some more to the west during the day. Campbell’s cute little mascot on the dash of the bus. 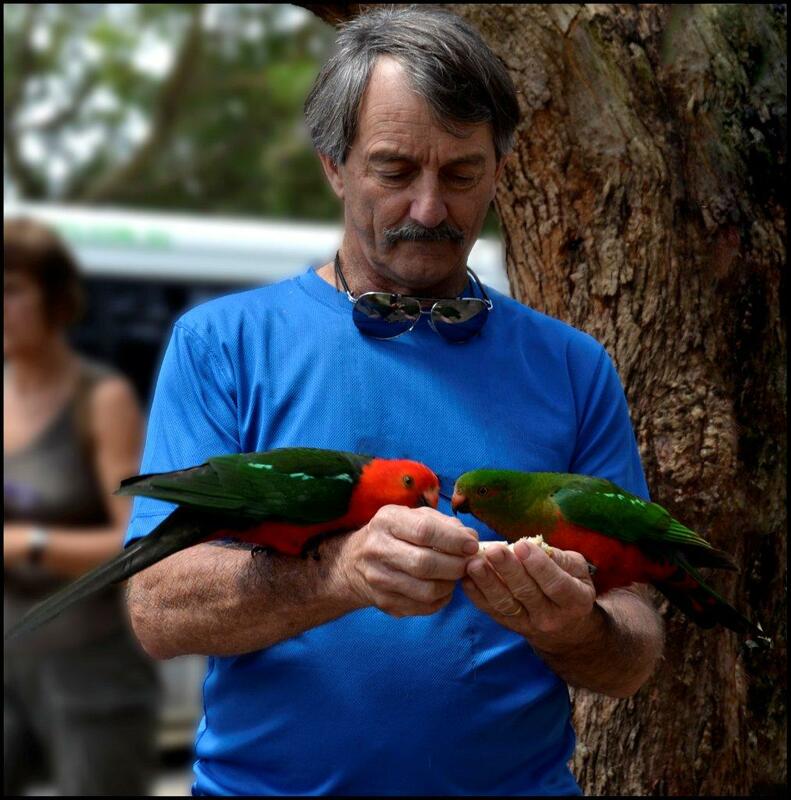 We stopped at Kennett River where these wild birds came down to hand feed from several small bus loads of tourists. David enjoyed feeding them, while I enjoyed taking photos. 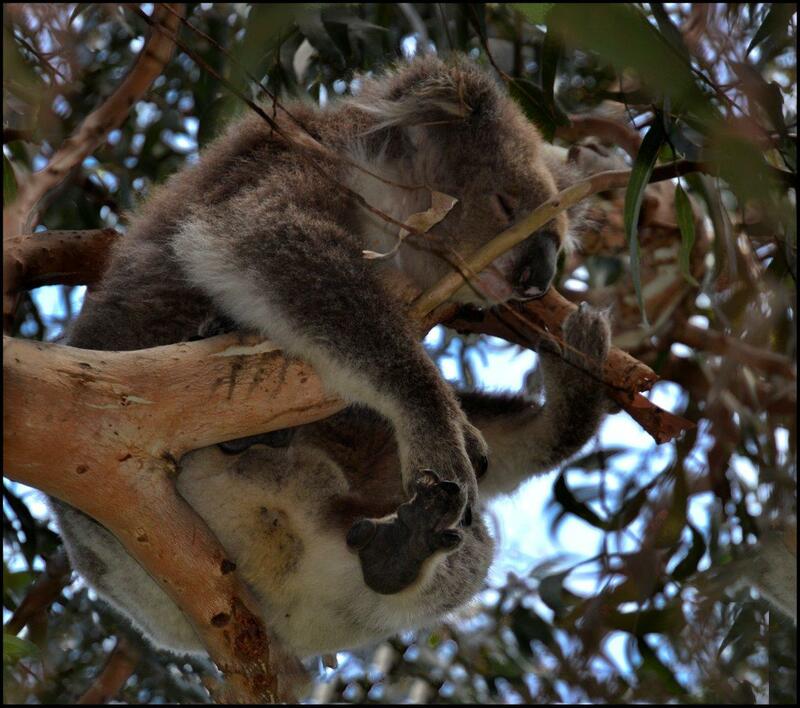 And at the same place we found wild koalas in the trees. We’d never seen wild koalas before, only in parks in enclosures so this was quite exciting for us. 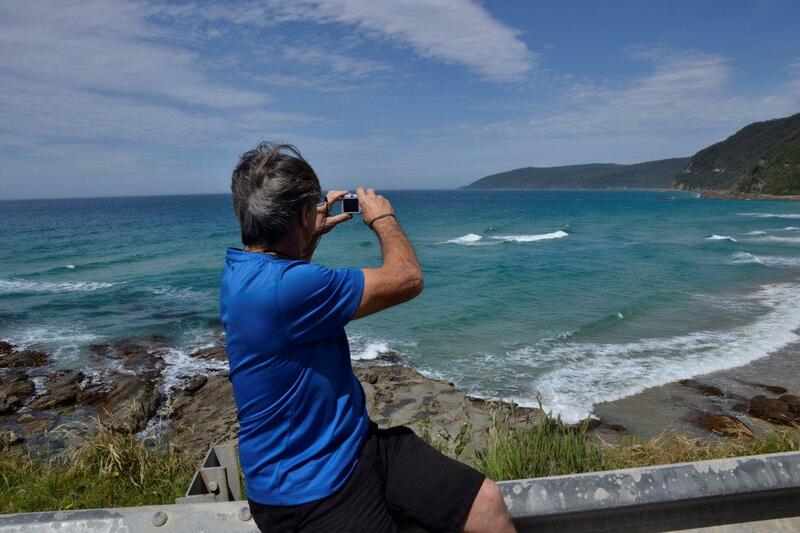 Just David at one of the photo stops along the Great Ocean Road. 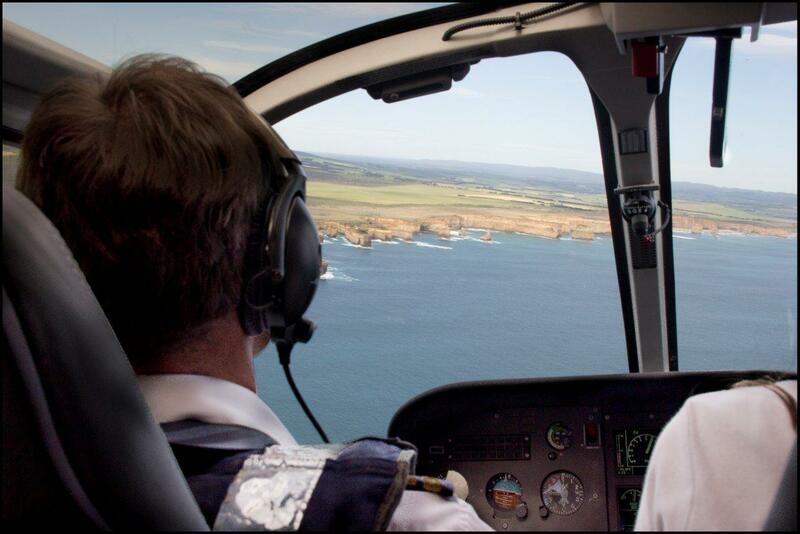 Soon after this we stopped at Apollo Bay where tables had been booked for our lunch at the ‘Iluka Restaurant’. We’d already chosen what meals we wanted from the menu shown to us on the bus and Campbell had phoned the choices through. The meals were very pleasant indeed – David had a selection of vegetarian salads and I had grilled fish with chips and a side-salad. We were most surprised that the meal did not include tea or coffee though so David went and bought us one each in takeaway cups. Fortunately I took the lid off mine because they’d forgotten the milk, so he got that rectified for me. Just along from the restaurant was a shop named ‘The Icecream Tub’ and Campbell had told us that they had won many, many awards for their ice creams and had a mind-blowing array of flavours. These included vegemite, and red bull. Yes, vegemite ice cream!!! I can’t begin to imagine! We were happy with our tea and coffee. From here we headed inland for a while and soon made a stop where we went for a short walk through forest land. 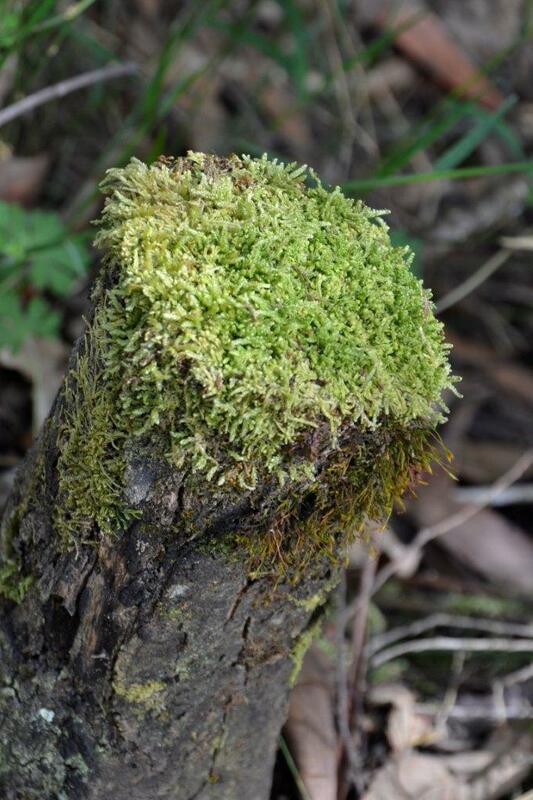 I loved the moss on this broken tree. 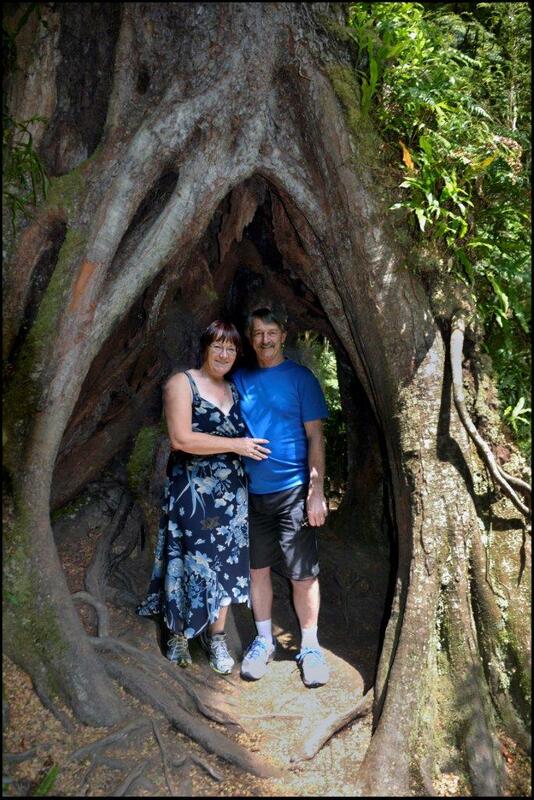 And here, Campbell took a photo for us inside the base of a very large tree. 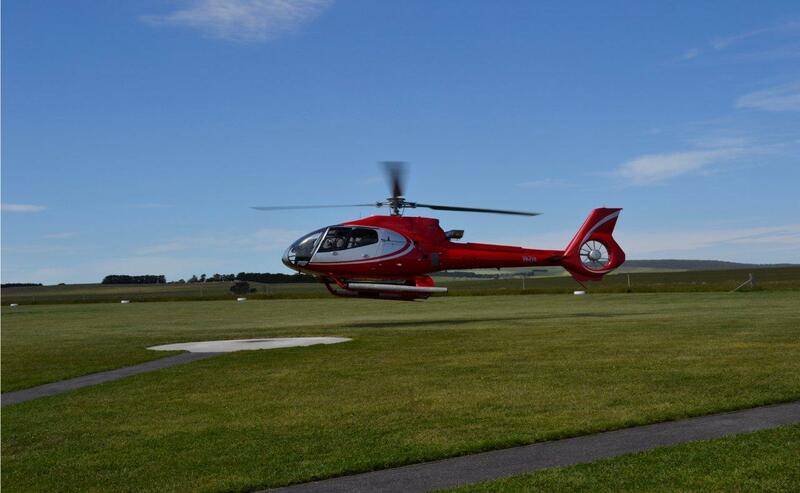 It was a bit of a wait for ‘our’ helicopter to land, even though there were 4 of them making trips. Obviously this was a very popular thing to do. 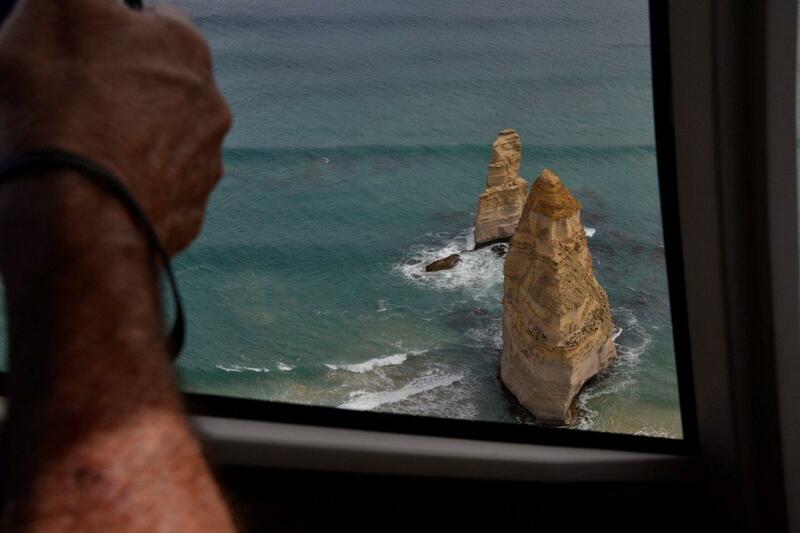 One couple from our bus had never flown in a helicopter before and were quite nervous but we reassured them. And here it comes… the one we were to fly in. David looking very much like he was about to pilot us, but we were actually sitting in the back seat with our new-found friends and there were 3 girls in the front next to the pilot. I was quite surprised at how the pilot was squeezed into one little corner! 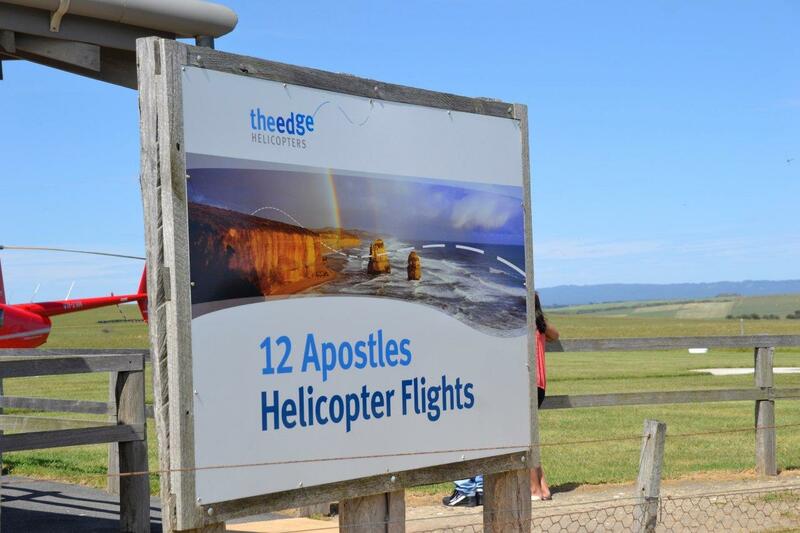 And here was the purpose of our flight – the Twelve Apostles. Though there are only 7 left. 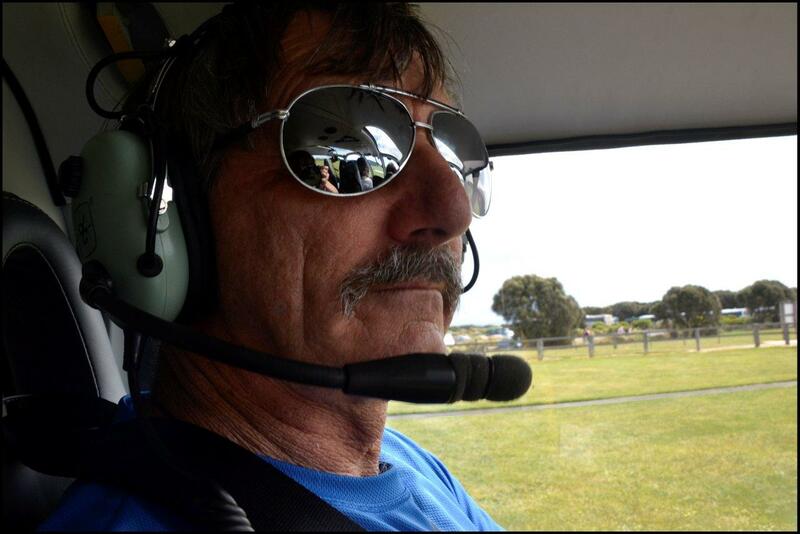 I asked the pilot what speed we were doing and he replied 180 kph. Wow! It didn’t feel much faster than about 60-80 kph! David taking a photo while we were in the air. Another aerial shot. 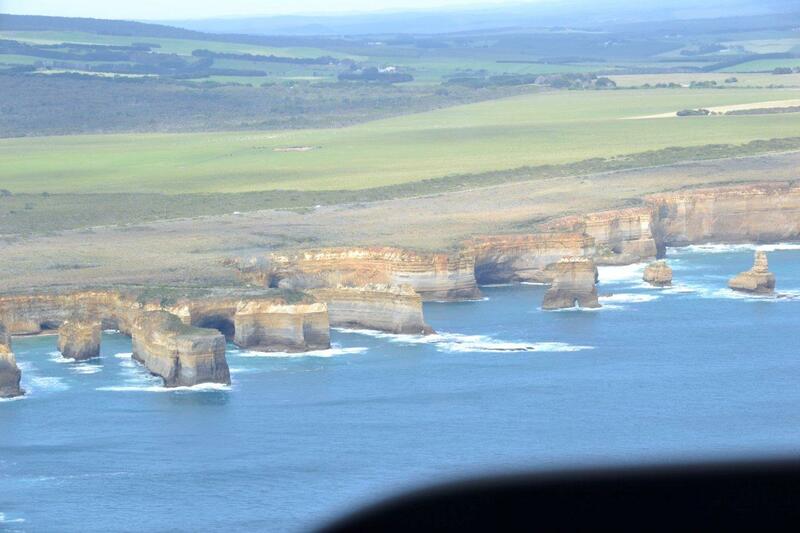 A bit misty through the windscreen, but such is life, and you can still see the pretty layers in the cliffs. 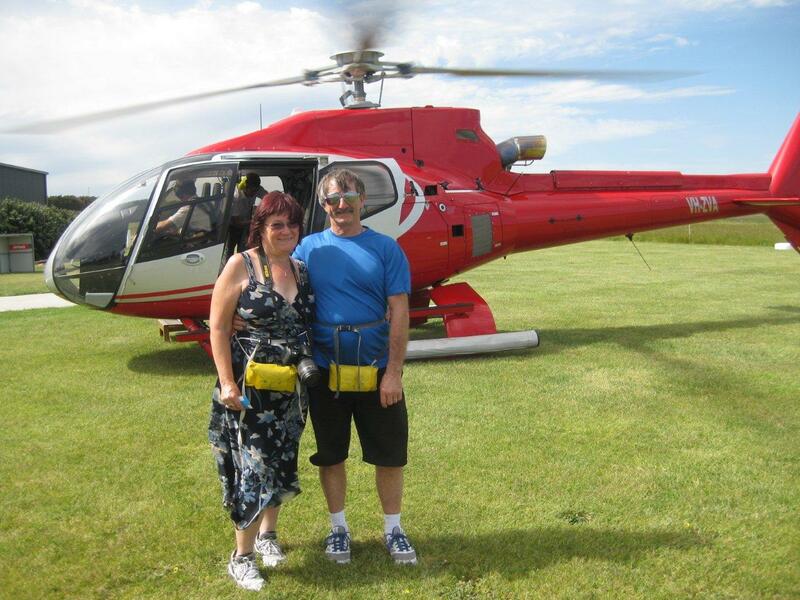 And here is us as we came away from the helicopter after our flight. The flight was just 8 minutes long, but did seem longer, and the money (it was expensive!!!) will be forgotten long before the memory of the flight. Now we set off on foot to go to the look out, and I can’t leave this man *anywhere* without him finding a woman – and usually a pretty one. I turned my back on him for 2 seconds and this is what happened! She had asked him to take a photo of her so I grabbed the opportunity to shoot the whole scene anyway. 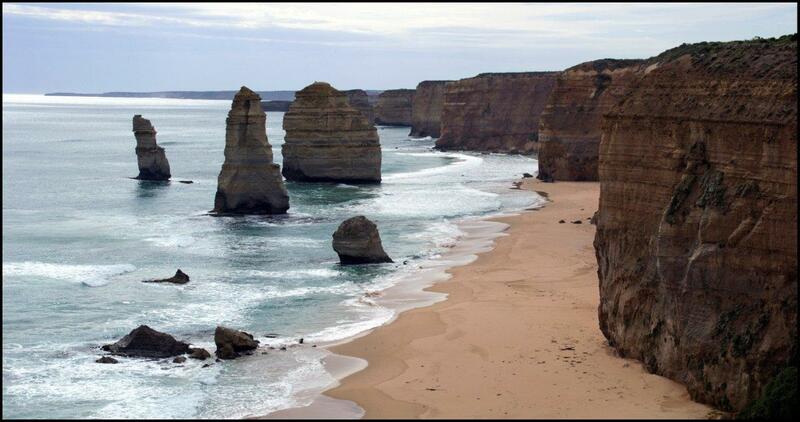 My own favourite shot of the Twelve Apostles. 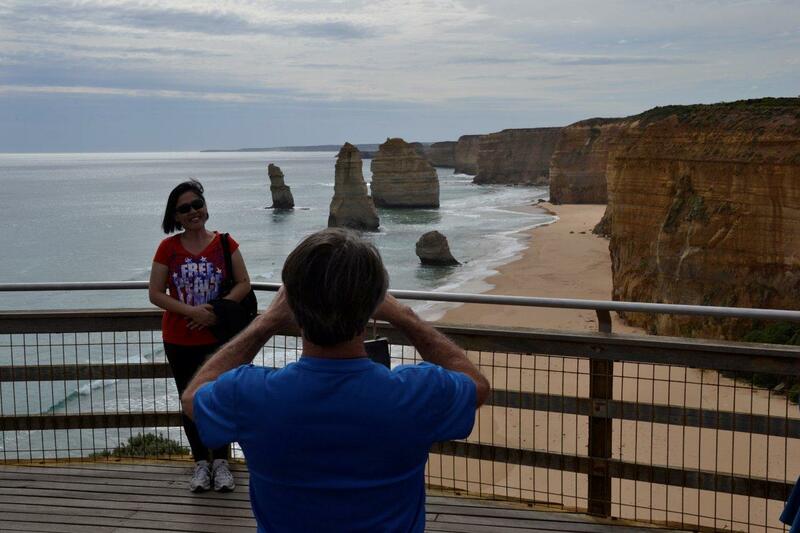 After this we stopped off at ‘London Bridge’ and also Loch Ard Gorge but, if I’m honest, it started to feel like more of the same, and we were happy enough when it was time to head away from the coast and go inland once more. We took a different route back towards Melbourne and this included a stop off at Colac to grab some dinner. We chose a noodle place and I ended up with a fair sized bowl of ‘soup’ which was scalding hot and ended up having to take it onto the bus to finish eating. I managed to eat enough to get it down to a level where it wouldn’t spill as we travelled before boarding the bus and could then eat at my leisure as we travelled along. And I finished just in time to be able to grab my camera as David told me to ‘look at that sunset’! And so we pretty much came to the end of what had been a long but adventurous birthday for David. We were dropped back at the hotel at 9:45pm and went to the bar for a nightcap. I chose a cocktail named a ‘cherry bomb’, which turned out to be very nice indeed, and David had a beer, and then we absolutely crashed, exhausted, into bed. Dammit!!!! And you’ll see why in tomorrow’s story. I’ll hold you to that it would be fantastic ? Yes, we’ll Tramcar dine together and watch the world chug past the window squee! Aawww thanks my Mally. You know my stories always call it as I see it, and we really did love Melbourne and hope to visit again. And we’ll pre-book a meal on the Colonial Tramcar Restaurant next time LOL It was so good to meet you, but shhhhh I haven’t told that part yet.